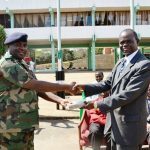 On Thursday, May 18, 2017, the Bible Society of Malawi presented over 3,000.00 CEV Camouflage Bibles to the Malawi Defence Force (MDF) in Lilongwe. The Bibles were received from Operation Africa, an international mission organization committed to the evangelization of military groups and armies in Africa. 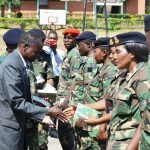 The presentation ceremony was held at the MDF Headquarters in Lilongwe during a morning devotion parade. Receiving the Bibles on behalf of MDF, Lt. Col. Saenda thanked the Bible Society of the timely gift and stressed the importance of the Bible in the lives of soldiers. 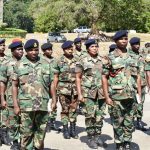 MDF Chaplain, Captain Rev Andrew Kamponda, who led the devotion parade expressed the need for more Bibles, even in vernacular because the MDF has many soldiers who are in military barracks as well as in foreign assignments. The Bible Society of Malawi Board Chairperson, Mr Dasford Kamkwamba, thanked the MDF for being God fearing and putting God first in their duties. He said we was happy to present the Bibles Bible Society and Operation Africa.